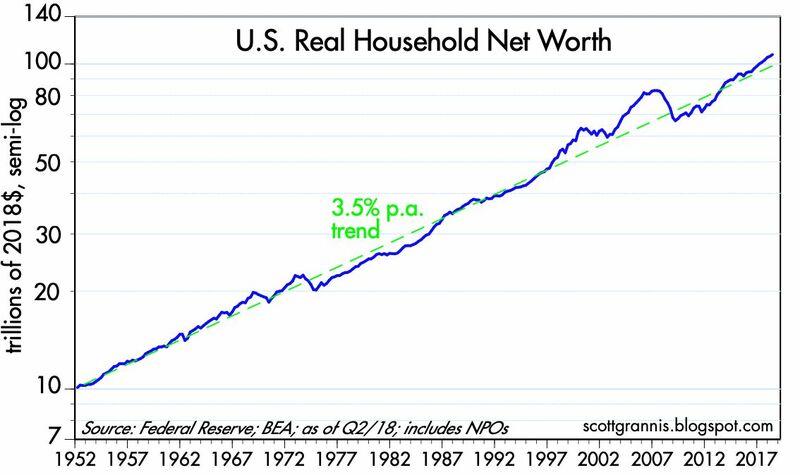 The Fed last week released its Q2/18 estimates for Household Net Worth and related measures of prosperity. 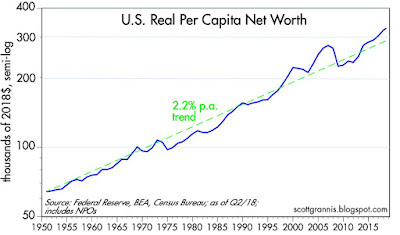 Of note, households' leverage (liabilities as a % of total assets) fell to a 33-yr low, and households' net worth hit hit a new all-time high in nominal, real, and per capita terms. 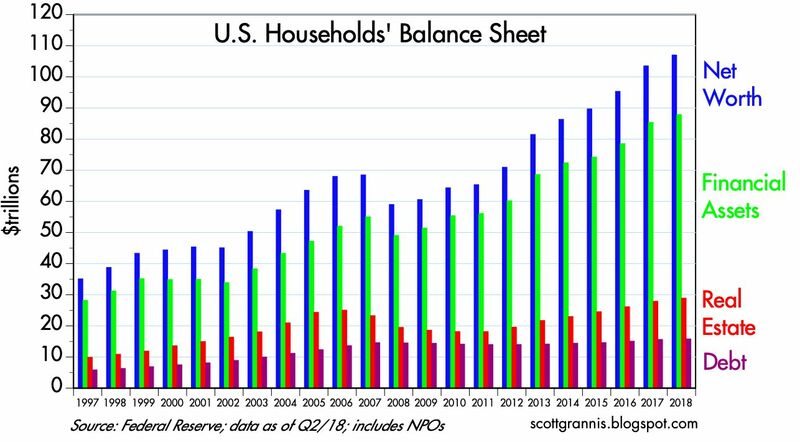 Total household net worth is now almost $107 trillion, up over 50% from pre-2008 highs, whereas liabilities are up only 7% from their Great Recession highs. Housing values have increased by about 15% since their 2006 bubble highs, but are still about 6% lower in real terms. 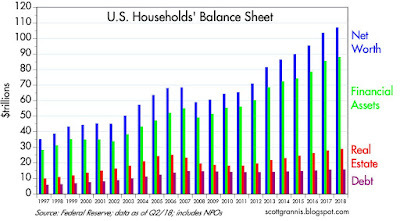 Households have been busy deleveraging, saving, and investing, and the housing market is back on its feet and healthy. Major trends are all virtuous and consistent with past experience. As Chart #1 shows, private sector (households and non-profit organizations) leverage (liabilities as a percent of total assets) has now fallen 36% from its early 2009 high, and has returned to levels last seen in early 1985, when the economy was in full bloom. 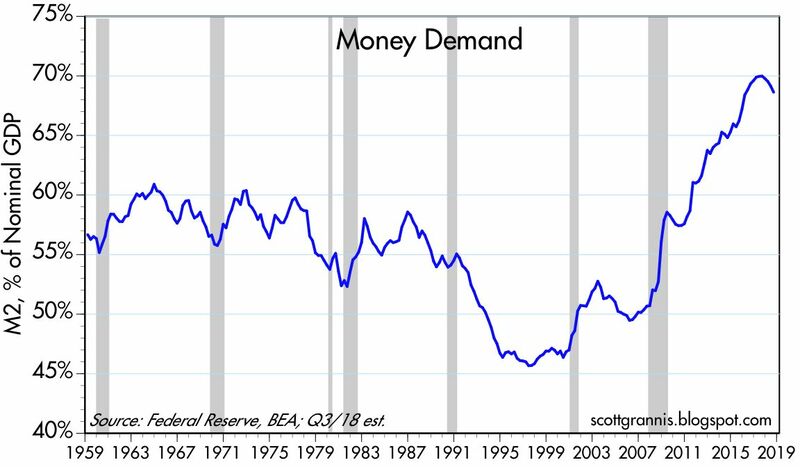 Our federal government, in contrast and very unfortunately, has borrowed with abandon, raising the burden of federal debt (federal debt owed to the public, as a percent of GDP) from 37% to 83% over the same 33-year period. If our government were run with the same discipline as households have displayed, that might be termed nirvana. We're as well off as we are today despite the ministrations of our government. 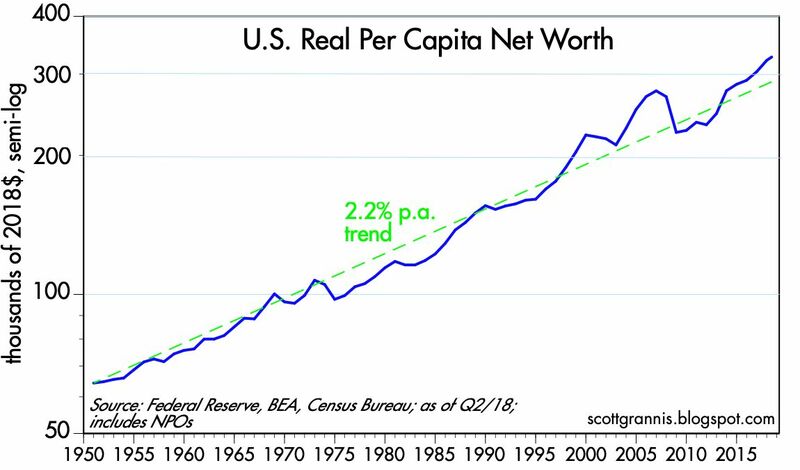 To be sure, there are lots of mega-billionaires these days who are skewing the statistics upward, but that doesn't imply that the average person's living standards have declined. Virtually all of the wealth of the mega-rich is held in the form of equity or real property investment, and all of that is available to everyone on a daily basis. A person making an average income in the U.S. enjoys all the advantages that our nation's net worth has created. Regardless of who owns the country's wealth, everyone benefits from the infrastructure, the equipment, the computers, the offices, the homes, the factories, the research facilities, the workers, the teachers, the families, the software, and the brains that sit in homes and offices all over the country and arrange the affairs of the nation so as to produce over $20 trillion of income per year. Would the average wage-earner (or, for that matter, the average billionaire) in the U.S. enjoy the same quality of life if he or she earned the same amount while living in a poor country? I seriously doubt it. This post recaps the market-based indictors that I think are very important to follow. On balance things look quite favorable. As always, all charts contain the most recent data available as of today (with a few exceptions, as noted, where I have estimated the latest datapoint). 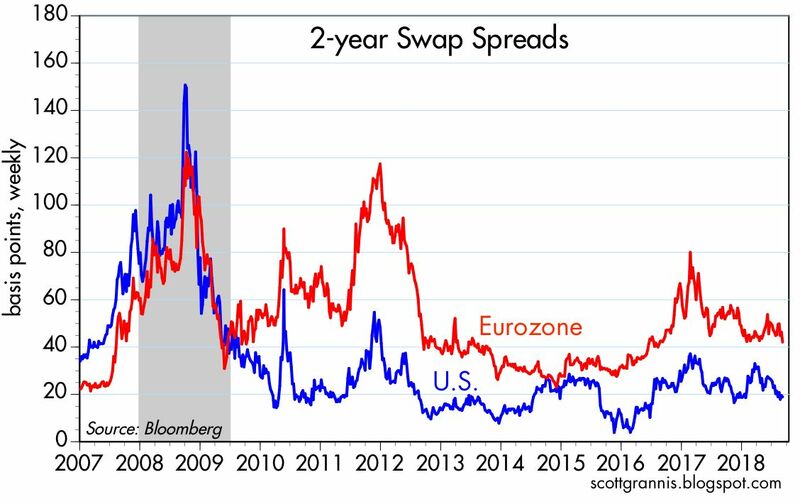 I like to begin with 2-yr swap spreads (Chart #1), since they have proven to be excellent leading and coincident indicators of the health of financial markets and of generic or systemic risk (the lower the better, with 15-35 bps being a "normal" range). A more lengthy discussion of swap spreads can be found here. Currently, swap spreads are almost exactly where one would expect them to be if markets were healthy and the economy were growing comfortably. 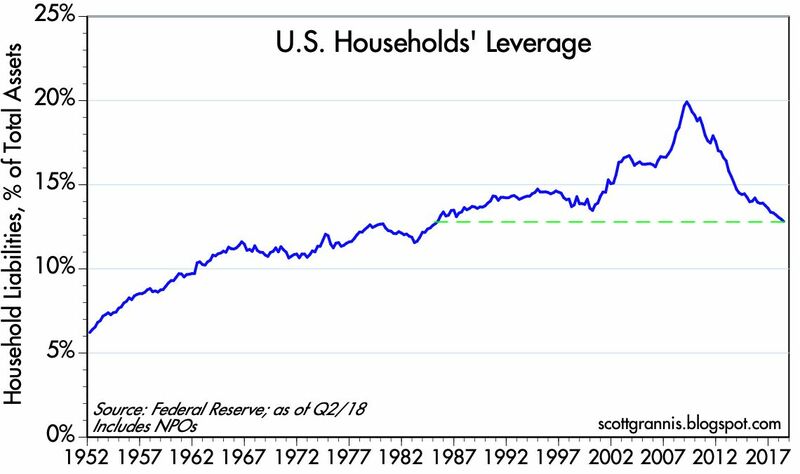 The current level of swap spreads also tells me that liquidity is abundant; i.e., the Fed has not squeezed credit conditions nor tightened enough to disturb the underlying fundamentals. 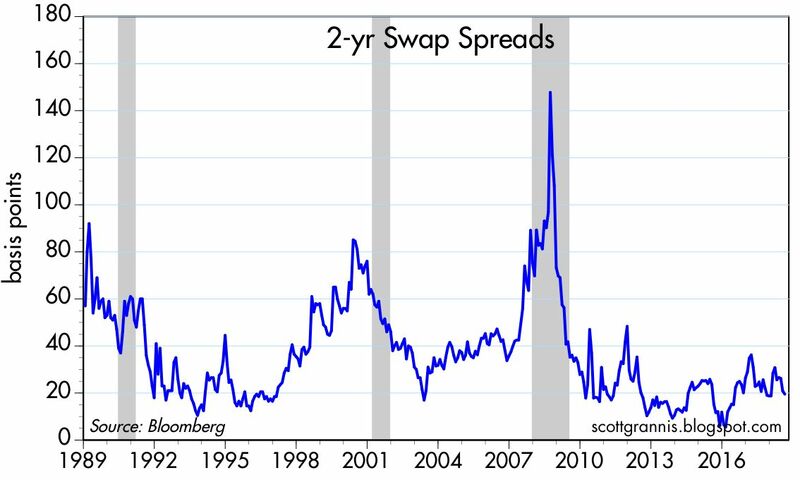 Note that swap spreads have increased meaningfully in advance of past recessions and have declined in advance of recoveries. At current levels, swaps are consistent with healthy financial markets and an improving economy. 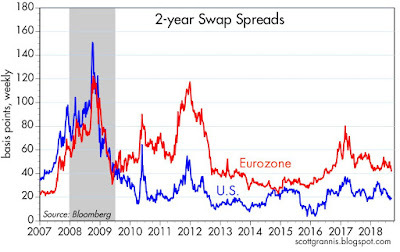 Chart #2 shows the same 2-yr swap spreads over a shorter period, and it adds Eurozone swap spreads for comparison. 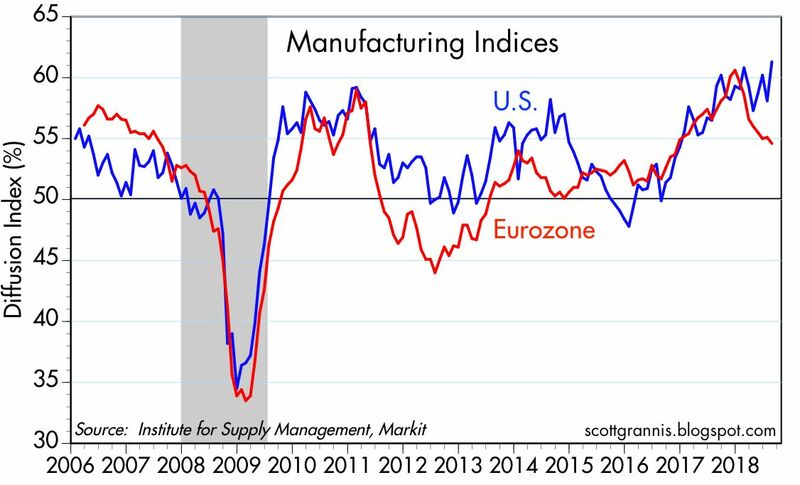 I note that conditions in the Eurozone have not been as healthy as in the US for some time now, but conditions do appear to be improving on the margin of late. 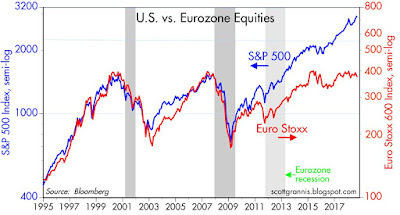 Not surprisingly, Eurozone stocks have underperformed significantly over the past decade. All eyes are thus on the US as the world's growth engine. 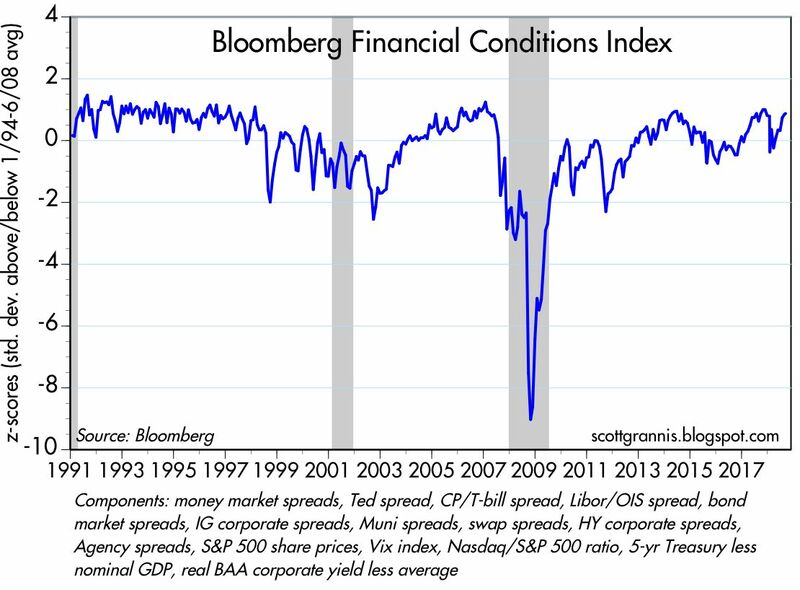 Bloomberg publishes an index of financial conditions which incorporates a wide variety of market based indicators, shown in Chart #3. In contrast to the swap spreads chart, higher values of this index are good. 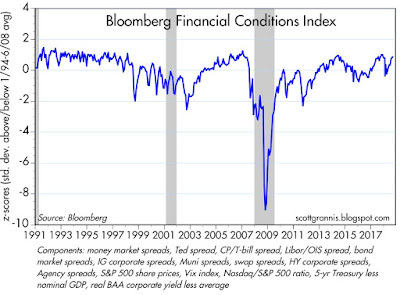 Here again we see that financial conditions are healthy and have rarely been better. 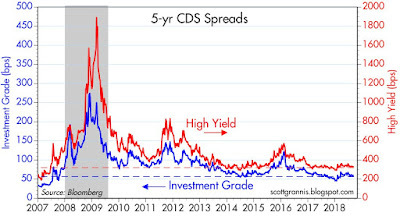 Chart #4 shows 5-yr CDS spreads (credit default spreads). These instruments are widely utilized by institutional investors, and are considered to be a highly liquid proxy for generic credit risk. Today, CDS spreads are rather low, which is good, though they have at times been lower. 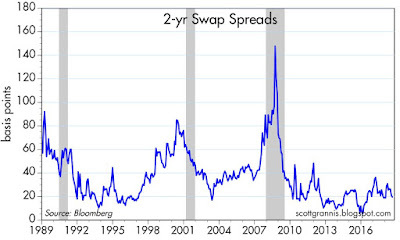 As with swap spreads, these spreads tend to rise in advance of economic trouble. So far they show not sign of any threats. 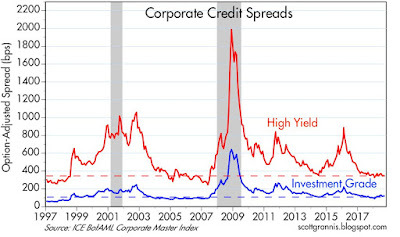 Chart #5 shows average credit spreads for investment grade and high yield corporate bonds. They tell the same story as CDS spreads: conditions today are healthy. 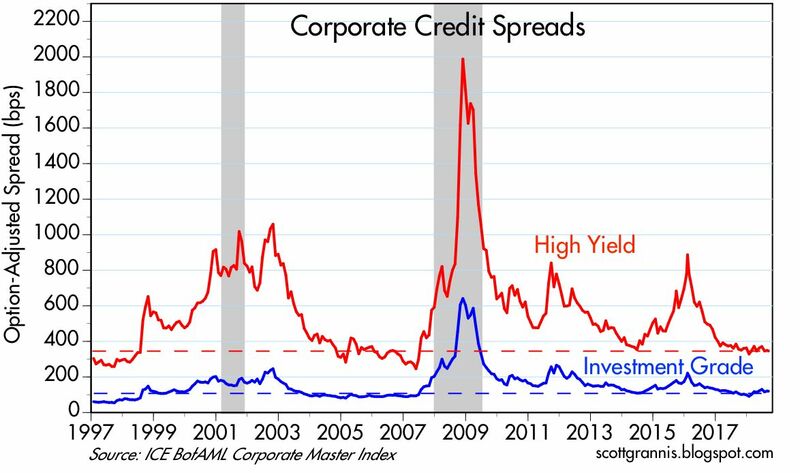 The bond market is not concerned about credit risk, nor is it concerned about downside risks to the economy. 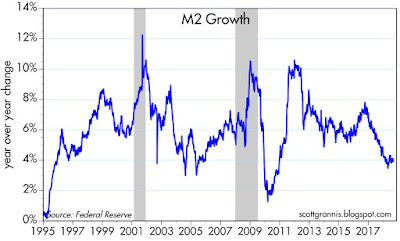 Chart #6 is a classic, since it shows how Fed tightening has preceded every recession in the past half century. 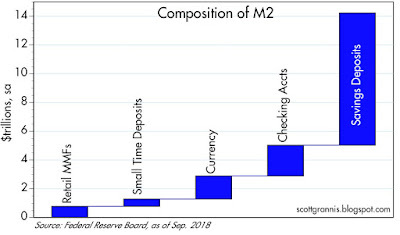 Monetary tightening shows up in different ways: 1) in the level of real short-term interest rates, over which the Fed has direct control, and 2) in the slope of the yield curve. 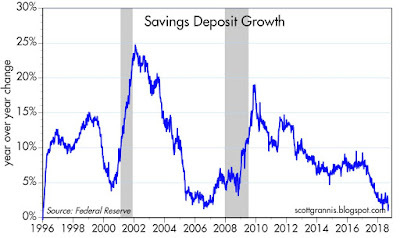 When real short rates rise significantly and the yield curve becomes flat or inverts, a recession eventually follows. 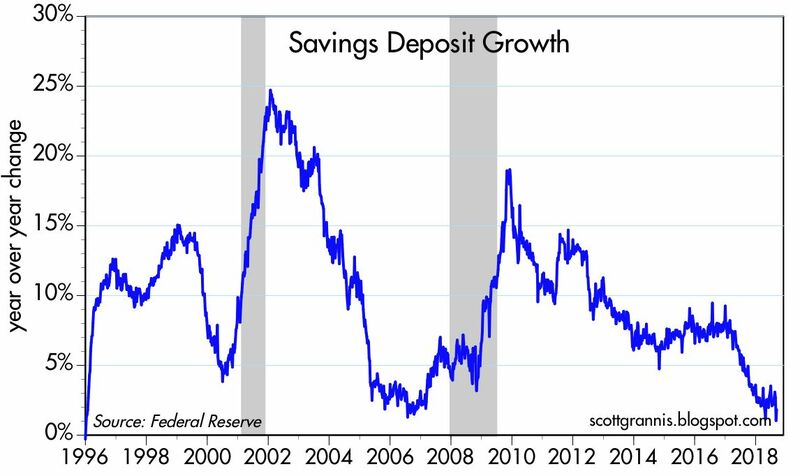 Today many worry that the yield curve is almost flat, but it's important to view this in the light of very low real short-term rates. 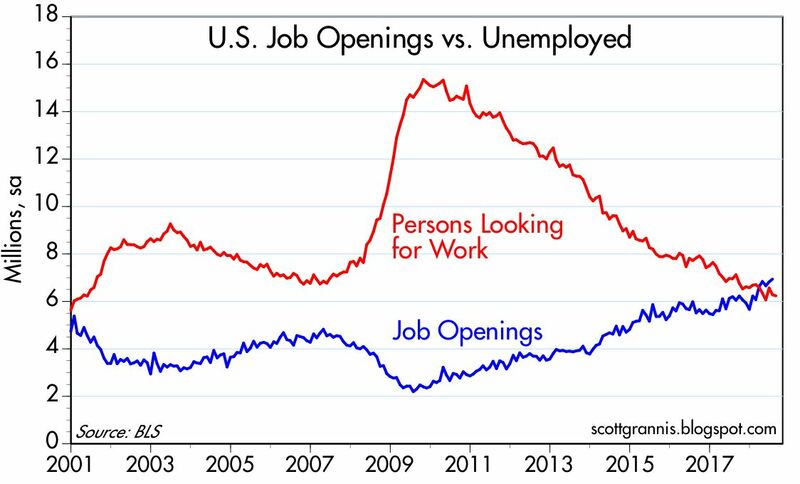 This combination tells me that the Fed has not yet begun to tighten monetary policy. The current slope of the yield curve tells us that the market expects the Fed to raise rates gradually, and not excessively. To date, the various hikes in the Fed's target rate have served mainly to offset a gradual rise in inflation over the past year or so. At its current pace, the Fed is likely years away from becoming "tight." 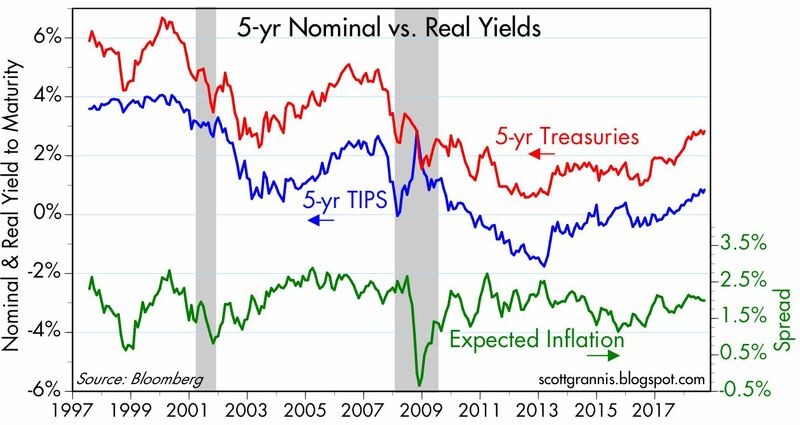 Chart #7 compares the nominal yield on 5-yr Treasuries to the real yield on 5-yr TIPS (inflation-indexed bonds). The difference between the two is the market's expected average rate of consumer price inflation over the next 5 years. Inflation expectations are relatively stable, and at 2%, they are almost exactly what the Fed is targeting. 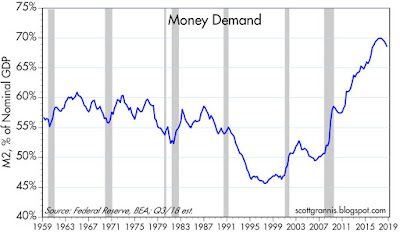 From this we can assume the Fed is doing a reasonably good job of balancing the supply and demand for money. This should be comforting and reassuring to a market that continually frets that something might be on the verge of going wrong. 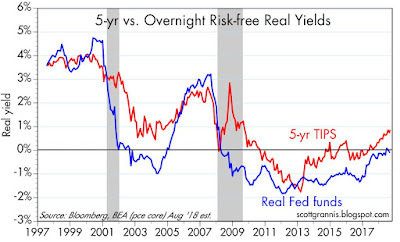 Chart #8 compares the real yield on 5-yr TIPS to the inflation-adjusted (real) yield on the overnight Fed funds rate. The latter is the same series shown in the blue line of Chart #6 above. 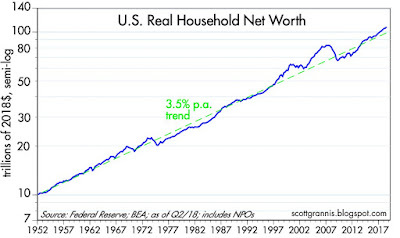 The comparison of the two here is important, since the red line is effectively the market's best guess as to what the blue line will average over the next 5 years. This is thus another way of judging the slope of the yield curve. 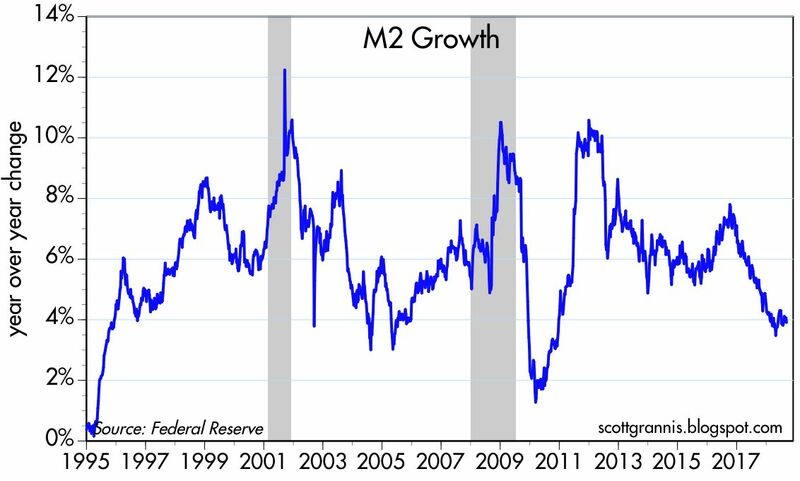 A true yield curve inversion would almost certainly find the blue line exceeding the red line, as it did prior to the past two recessions, since this implies that the market expects the Fed to ease monetary policy in the future, presumably because of deteriorating economic health. 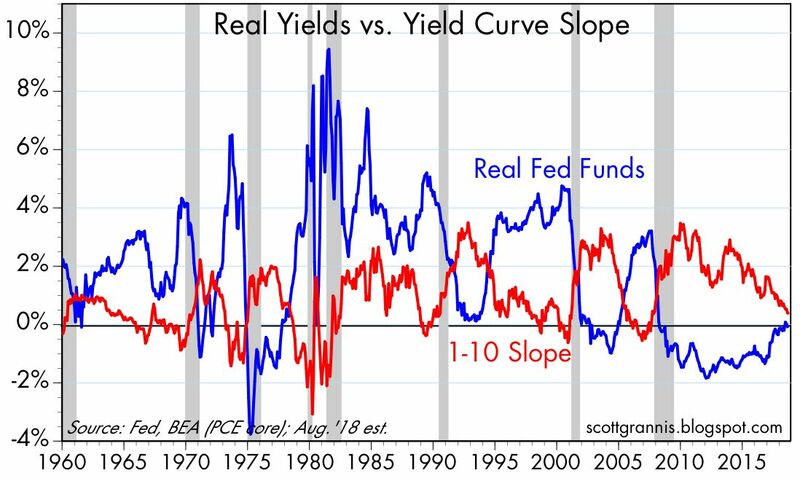 According to Chart #8, the front end of the real yield curve is steepening, not flattening, and that is good. 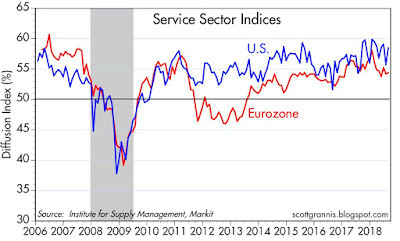 The market is mistakenly focusing too much attention on the nominal yield curve. 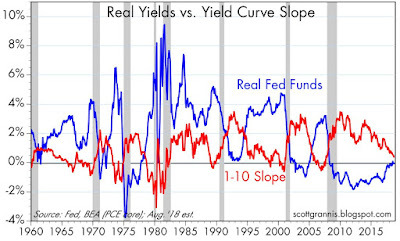 The real yield curve is more important, and its current message is definitely positive. 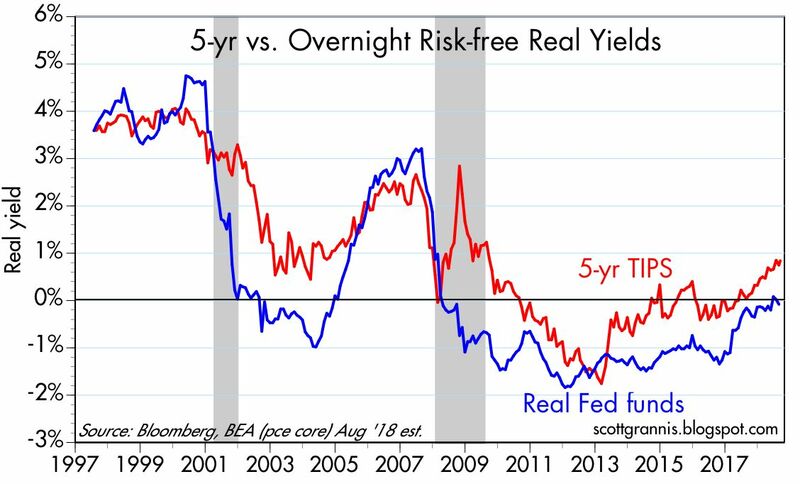 Real yields are driven in large part by the Fed's actions, especially in the very front end of the yield curve. 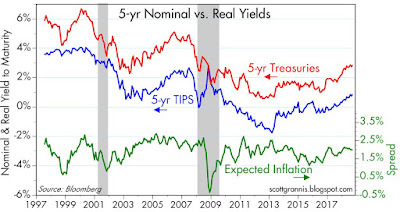 However, 5-yr real yields are also driven by the market's perception of the health of the economy. 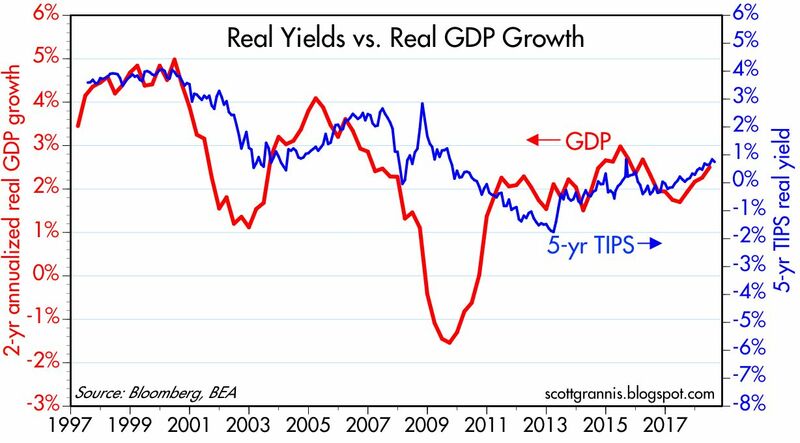 Chart #9 shows how the level of real yields tends to follow the economy's trend growth rate. 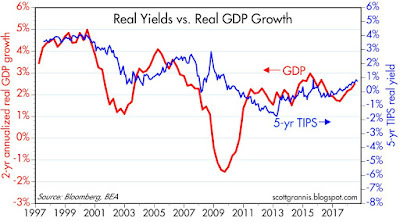 Currently, real yields are rising slowly, in line with the gradual strengthening of economic growth. There is no sign here of excessive optimism. 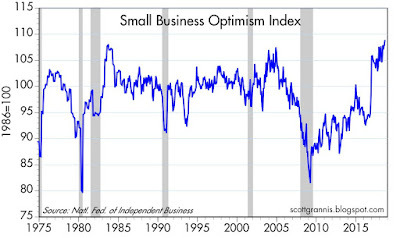 If anything, both the market and the Fed are behaving in a cautiously optimistic manner. On balance, all of these indicators are in healthy territory. 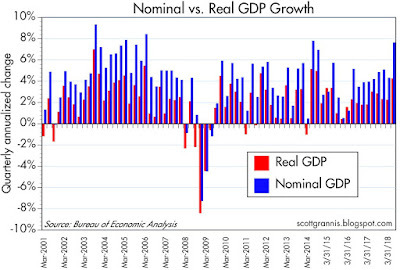 Consequently, it is reasonable to assume that the economy is going to be growing for the foreseeable future. Systemic risks are low, inflation expectations are low and stable, and liquidity is abundant. 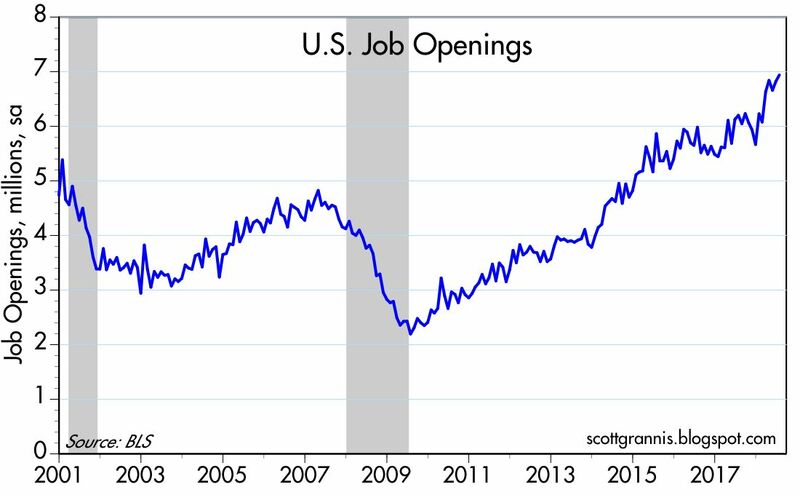 The Fed has been doing a good job, and there is no sign they are going to upset any applecart. There's not much more you could ask for at this point. We don't live in a risk-free world, however. For now, what risks there are, are concentrated in the trade-related sectors, thanks to the tariff wars that Trump seems to relish. Trade risks are undoubtedly acting as a headwind to growth, without which the market might be getting quite enthusiastic about the future. UPDATE (9/11/18): Chart #10, below, shows just how dramatically US stocks have outperformed their European counterparts. An investment in the S&P 500 has returned 22% more than a similar investment in the Euro Stoxx 600 since just before Trump's election. 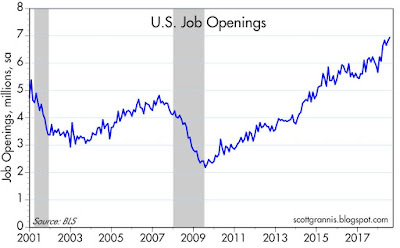 The bullish case for the economy (and by extension the stock market) is getting stronger. 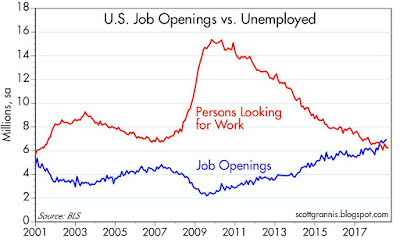 Here are some charts using recent data releases that tell the story. 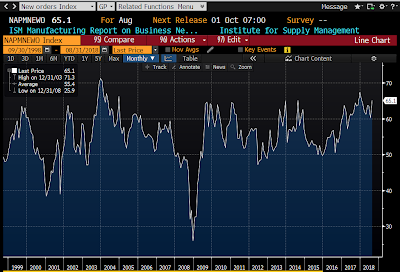 Manufacturing activity has definitely picked up, and corporate profits are not only strong but rising, leaving equity valuations only moderately above average. All of this is symptomatic of an economy that is slowly but surely ramping up its growth engines, and an equity market that is cautiously pricing all of this in. 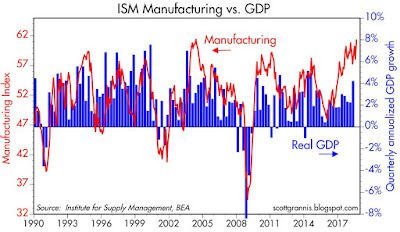 Chart #1 compares the ISM manufacturing index with the quarterly annualized growth of GDP. 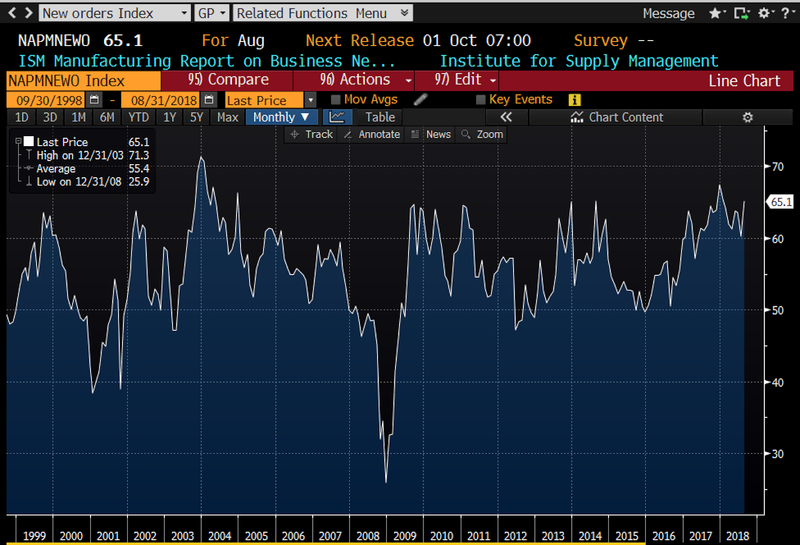 The manufacturing index is about as strong as it has ever been, and in the past, numbers like this have been consistent with GDP growth of at least 4-5%. Expect Q3/18 to be at least 4%, which in turn would make year over year growth in GDP the strongest in 13 years. 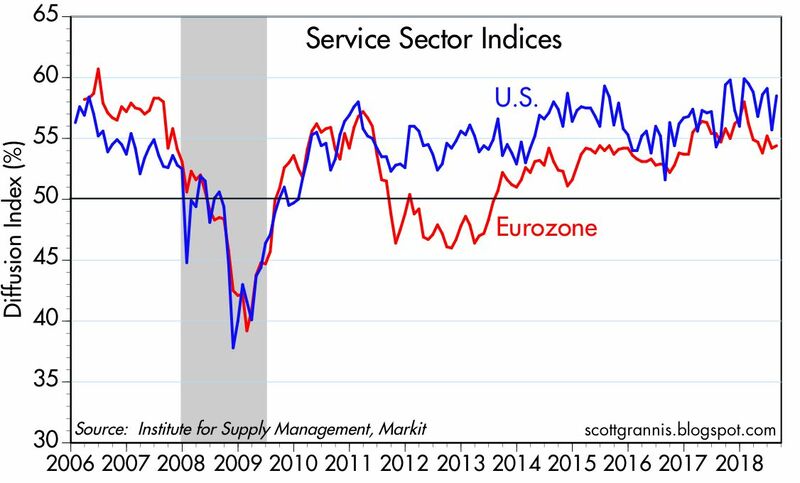 Meanwhile, Chart #2 shows that the service sector remains quite healthy as well, more so than in the Eurozone. 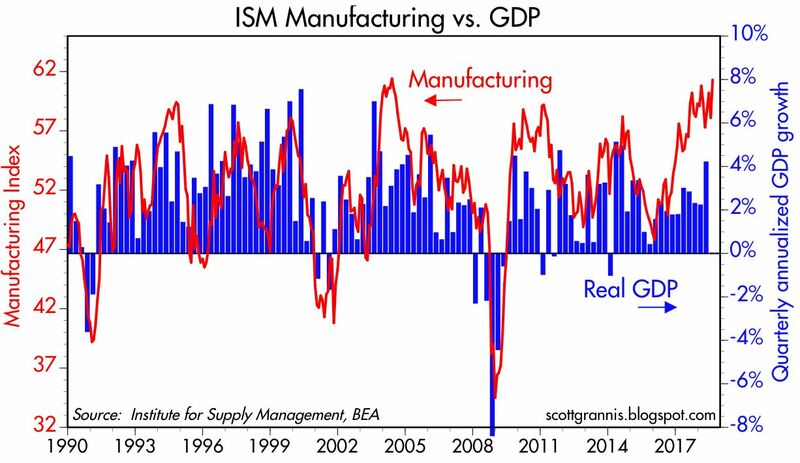 Chart #3 shows the ISM new orders index, which is also rather strong. The October 2016 reading was 53.3 (just before the November '16 elections), and it has since jumped to 65.1. 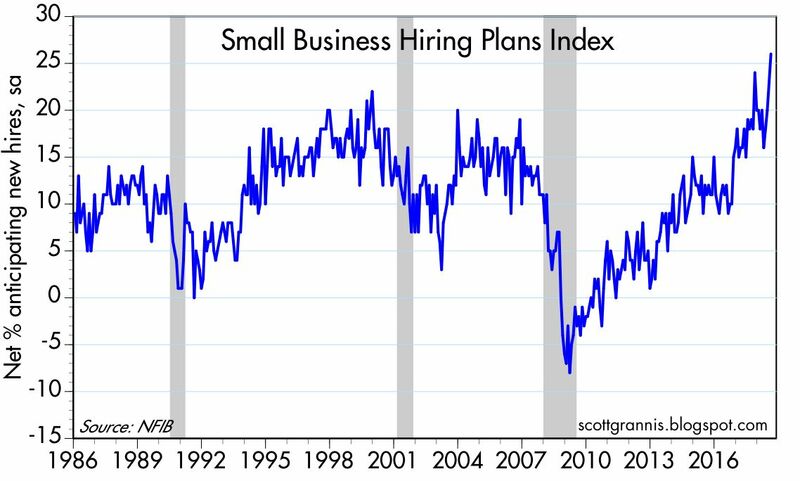 This is a good sign that business confidence has surged and that businesses are ramping up spending on new plant and equipment. This is the seed corn of future productivity growth and an excellent portent of a stronger economy to come. 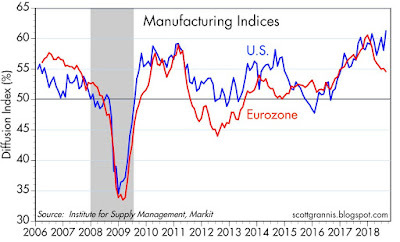 Chart #4 compares the ISM manufacturing index to its Eurozone counterpart. Things aren't looking so good overseas of late, which is unfortunate. But this could simply be a reflection of the fact that with the big drop in corporate tax rates in the U.S., businesses are pouring resources into the US at the expense of Europe, where tax rates are still high. 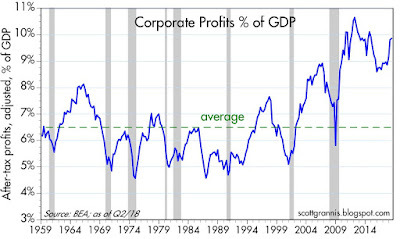 Chart #5 shows the ratio of after-tax corporate profits (as measured by the National Income and Product Accounts, which in turn are based on data submitted by corporations to the IRS) to nominal GDP. 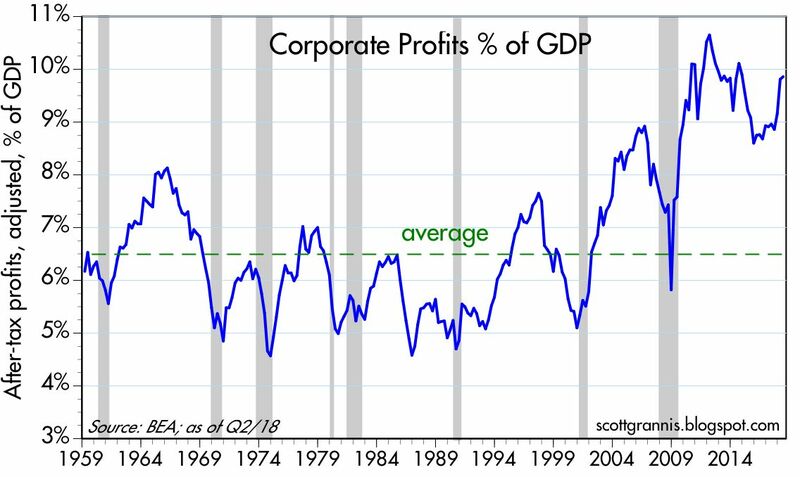 By this measure, corporate profits have rarely been so strong. 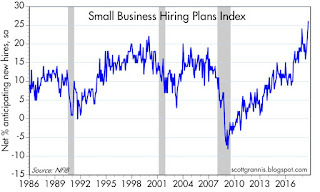 This is of course due in large part to the reduction in corporate tax rates. Skeptics will say that lower tax rates have simply lined the pockets of the fat cats, and that little or none of this will trickle down to the little guy. I think this is a very short-sighted way of looking at things. What is the first thing that corporations do when they find that their profits are growing? From my experience, having known and worked with many senior corporate executives, increased profits are the trigger for increased investment. No one wants to leave profitable activities unexploited. Chart #6 compares the yield on BAA corporate bonds, which I use as a proxy for the overall yield on all corporate debt, to the earnings yield (the inverse of the PE ratio) of the S&P 500, which I use as a proxy for the earnings yield of all corporations (i.e., the rate of return on a dollar's worth of investment in US corporations). As the chart shows, the past decade or so has a lot in common with the late 1970s; during both of those periods corporate bond yields and equity yields were very similar. 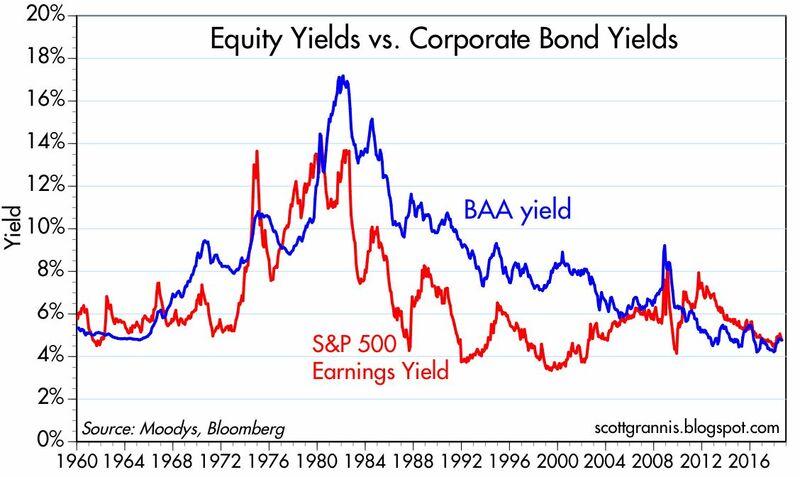 During the boom times of the 80s and 90s, however, the earnings yield on stocks was much less than the yield on corporate bonds. 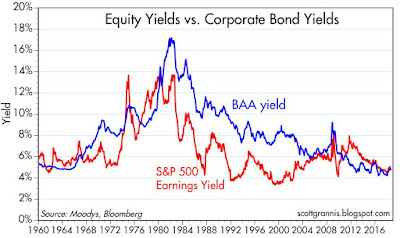 If the economy was humming along and confidence was high, you would expect the earnings yields on stocks to be less than the yield on corporate bonds. Why? Because corporate bonds have the first claim on corporate earnings—it's safer to own bonds than it is to own equity. Equity investors have a subordinate claim on earnings, but they are generally willing to give up current yield in exchange for greater total returns. 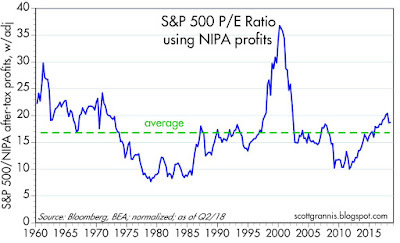 The fact that earnings yields and corporate bond yields are roughly equal these days tells me that investors aren't too confident that corporate profits will remain as strong as they have been for much longer. 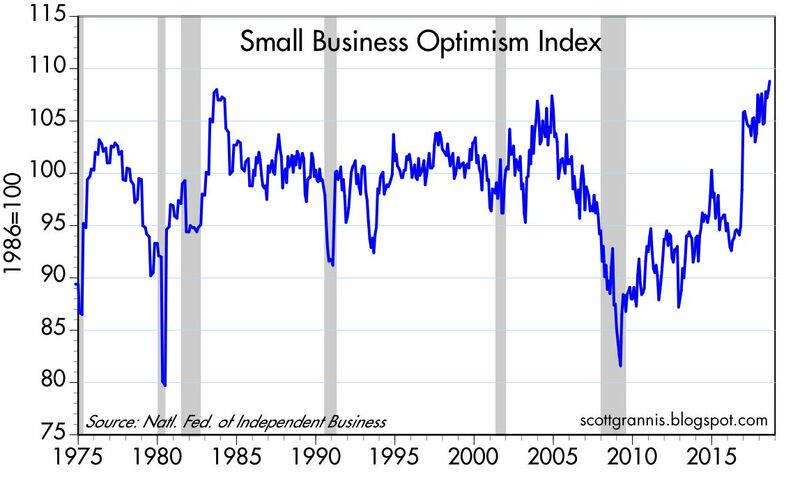 That's a sign of risk aversion, and risk aversion has been one of the hallmarks of the current business cycle expansion. I've been arguing for a while that risk aversion is slowly on the decline, and I expect that to continue. Looking ahead, earnings yields will probably stay flat or decline (i.e., PE ratios will probably remain steady or rise), while the yield on corporate debt should rise in line with rising Treasury yields, which in turn will be driven by more confidence and less risk aversion. 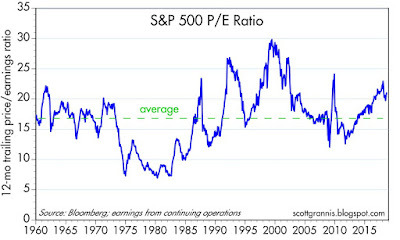 Chart #7 shows the current PE ratio of the S&P 500. This is calculated by Bloomberg using 12-mo. trailing earnings from continuing operations. 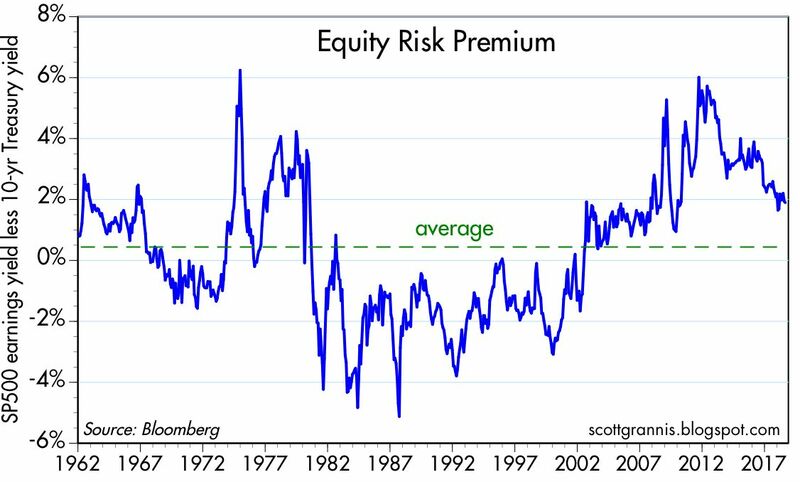 At just under 21 today, PE ratios are somewhat higher than their long-term average. 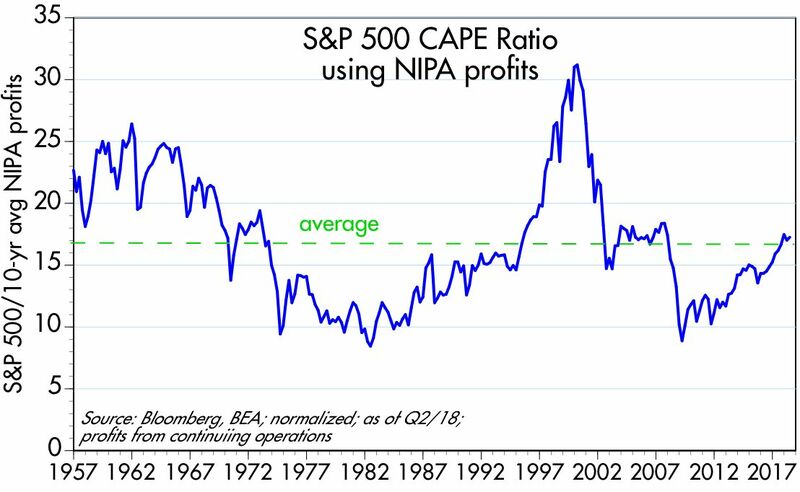 Chart #8 shows the PE ratio of the S&P 500, but using the NIPA measure of all corporate profits instead of reported GAAP earnings. 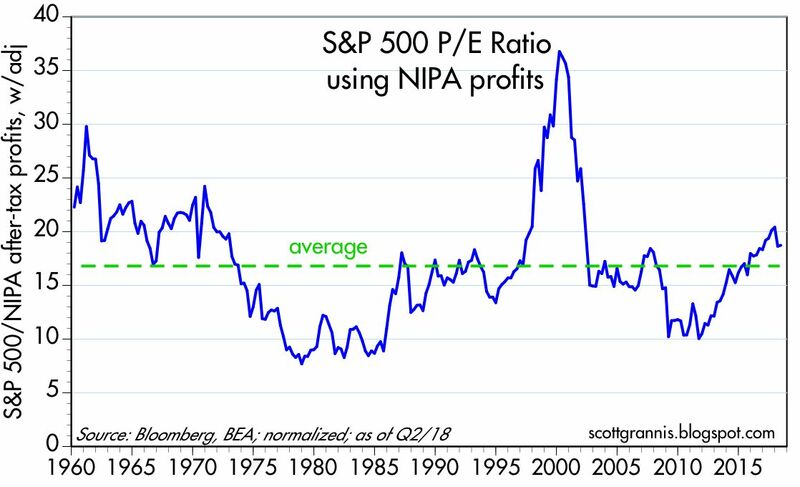 Here we see that equity valuations are only slightly higher than average, and far less today than they were during the "bubble" of 2000. Chart #9 shows the difference between the earnings yield on equities and the yield on 10-yr Treasuries. That's a measure of how much extra yield investors demand to bear the risk of equities instead of the safety of long-term Treasuries. In the boom times of the 80s and 90s, investors were so confident in the value of equities that they were willing to accept an earnings yield that was substantially below the interest rate on Treasuries. 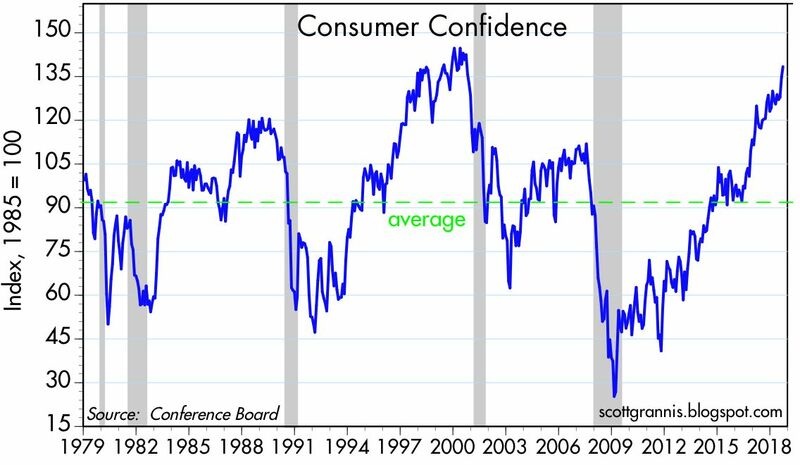 For the duration of the current recovery, however, that has not been the case at all. 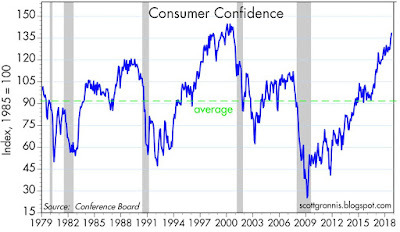 That's another way of appreciating just how risk averse this recovery has been. 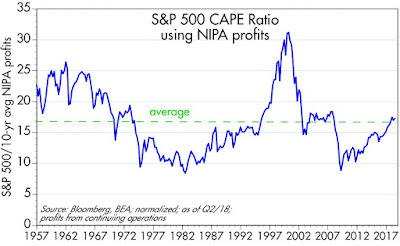 Chart #10 shows the PE ratio of the S&P 500 using NIPA profits (instead of GAAP profits), and Shiller's CAPE (cyclically adjusted price to earnings ratio) method of calculation. (Current prices divided by a 10-yr trailing average of after-tax quarterly profits.) 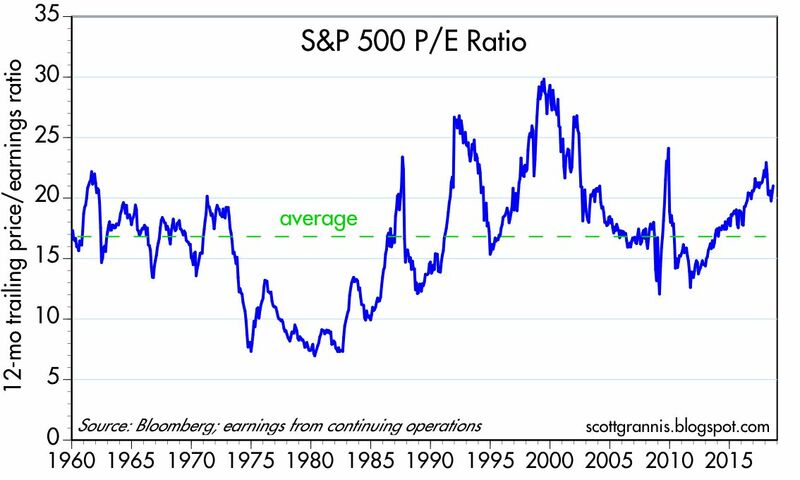 Here we see that PE ratios are only slightly above their long-term average. That's another way of saying that equities are far from being over-valued. Courtesy of Newsalert and MarketWatch, here is a chart that memorializes all the bearish calls of well-known analysts over the past six years. For the record, I have been consistently optimistic/bullish since December 2008. That call was a bit early (the bottom came three months later), but anyone who bought then and held through today is undoubtedly very happy with the results.